Professional Metal Sign Letters custom made from high quality Aluminum and then painted with your choice of high grade baked enamel colors. 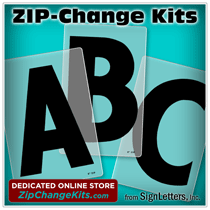 These beautifully painted metal letters are available in a large selection of standard paint colors, or you may choose to have our aluminum letters painted to match any existing colors. You can simply supply us with a matching number from color systems such as Sherwin Williams, PPG, Matthews, etc. 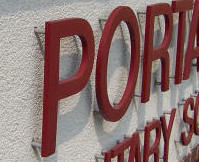 Shown in the photo (right) are flat cut aluminum letters, painted and installed using a stand-off stud mounting method. The deep stand-off will allow these aluminum letters to cast shadows which are offset (or "detached") from the letter itself.